Recently I've concluded that most professional photographers actually believe that telephoto lenses compress the subject and background in an image and that simply is not true. I got a call from a local photographer last week. He knew that I had recently filmed a tutorial on architectural photography with Mike Kelley and he had a question about lens distortion. While he was photographing a home interior, another well known and successful architectural photographer in the area approached him and offered to give him his "secret technique" to produce distortion free images. Instead of shooting one vertical 17mm image (which has significant distortion in the edges because it's so wide), he suggested that my friend shoot three horizontal shots with a 50mm lens while tilting the camera from top to bottom and stitching the files into one photograph. My friend was shocked by the simplicity and potential of this suggestion and called me to confirm it. "Is it really possible to get distortion free images this way?" He asked. No it's not. In fact the images will have an identical field of view. This was impossible for my buddy to believe so he had to put it to the test, and after comparing the two shots he found that I was right. The wide angle shot looked identical to a stitched shot created with multiple images from a longer lens taken from the same location. After the test he called me to tell that the distortion was indeed the same but he was still convinced a longer lens would produce more "lens compression" meaning that the foreground and background objects would appear closer. I then blew his mind for the second time; "You realize that if you take a portrait of someone with a telephoto lens and then take the exact same shot with a wide lens from the same spot but crop into that image, the 'compression' will look identical," I said. My buddy simply could not believe this to be true. He had always been taught that the lens was doing the "compressing." After quizzing a few other photographers I realized that the majority of professional photographers I know didn't understand this either. Lens compression has nothing to do with the lens and has everything to do with your distance from the subject. I explained to my buddy that lens compression doesn't happen in the lens, it happens when you physically move the camera back. No matter how I explained it he wouldn't believe me until he did the test himself. 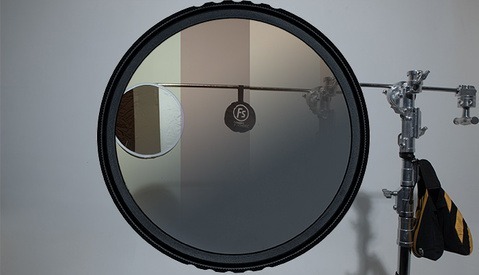 Why do we use the term "lens compression?" Most photographers believe that the lens is "compressing" the scene because they will take a test shot with a wide lens, and then back up to capture a similar composition with a telephoto lens. It's easy to see that the telephoto shot is far more "compressed" and it's also easy to completely overlook the fact that the camera has been moved and the field of view has changed. Imagine you are photographing a person and behind that person is a mountain. Let's say your subject is one foot away from the camera and the mountain is one mile behind your subject. From this distance the person's face would look huge compared to the mountain because the person is exponentially closer to the camera than the mountain. To make the person half the size that they currently are in the frame, you would have to move back only one foot, doubling the distance of the camera from the subject. But when we half the size of the person by moving back one foot, the size of the mountain remains almost identical because to make the mountain half the size you would need to move the camera back one mile. This ratio between the distance of the subject and background to the camera is what causes compression. As you continue to move backward your subject will get smaller and smaller and the mountain will remain about the same size. To keep the subject the same size in the frame, you will need to zoom in using a lens or "crop in" in post and as you do, you are enlarging both the person, who has been shrinking as you back up, and the mountain, that has remained basically the same size. When we look at the final images it may appear that the person is the same size in each picture while the mountain is growing but in reality the opposite is happening. The mountain is staying the same while the person is shrinking and we are zooming in to compensate. 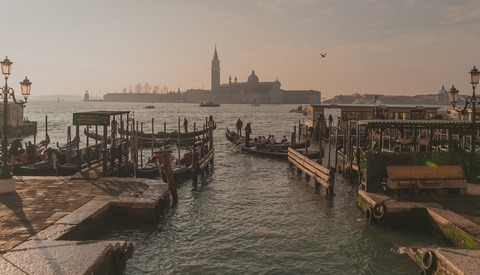 In this gif below you can see two images that Elia Locardi took during the filming of his landscape photography tutorial. In both shots, the camera was in the exact same place on a tripod. The image on the left was taken with a 16mm lens and the image on the right was taken at 145mm. Notice that when we "crop in" or "digitally zoom" the wide shot, we can get an almost identical looking image to the shot taken at 145mm with the exact same "compression." Compression is a real thing but it really doesn't have anything to do with a lens. It has everything to do with your distance from the subject/background. You could get a shot with identical compression if you stand in the same location and take a photograph with a telephoto lens, a wide angle lens but crop in, or a camera with a "digital zoom." The magic isn't in the lens, it's in simply backing up. And all of this leads back to the very beginning of the article. Is it possible to create a distortion free image by stitching multiple telephoto images rather than using a wide angle lens? No, because the distortion/compression is caused by the location of the camera in relation to the subject and not by the lens. If you stitch multiple images you'll end up with a higher resolution shot that has identical compression. This does not mean that telephoto lenses are obsolete. Long lenses allow us to back up and zoom in without losing resolution; everyone knows that. But this post simply explains the phenomenon of compression in general which many photographers do not fully understand. In talking with my photography buddies about this I've discovered that most photographers do not seem to know this. I'm curious how many of you reading this also didn't know that lens compression doesn't really exist. Take the poll below and let's find out. Third Option for the poll is the best one. Now this is a very nice post! Have been following this site, but now I had to register because of this one! From my perspective, anyone who plans going into phorography more seriously should at least learn basic physics and optics as well, not to mention electronics and how every component of your gear works. So...all of those that say that a 35mm on a crop sensor gives less compression than a 50mm on FF are wrong? I wouldn't have believed it if I hadn't seen your test! If the cameras are in the same spot then the compression will be the same. The depth of field will not be though. In the example I used above everything is in focus so it's a non issue but telephoto lenses will produce shallower dof compared to a wide shot cropped in. Unless, of course, you are using a faster WA on your crop sensor that offers a similar DOF as the longer FL glass on a FF. Such as, say, 50 1.8 on FF next to 35mm 1.4 on aps-c... the "look" you get will be similar enough that you could reasonably call DOF equivalent. Not the angle of view, but the DOF. "I got into this very same discussion last weekend at an air show that I was shooting with a 200mm next to guys with 600mm who claimed to have better "grouping" of Blue Angels because of "compression" their longer teles offered. We were shooting from the same spot ;)"
That is a fantastic example of a real world situation where this information is useful. It's nice to know the theory! Still, on a crop, you need to get further away to get the same shot as a FF camera but at least we know it's the distance, not the lens, that affect compression. The angry photographer on YouTube is trying to dispute your article (not doing a great job to be fair) and someone called him Dr Robotnik without a mustache and I pissed myself laughing. Sorry I know it's mean but I can't help how funny that was. 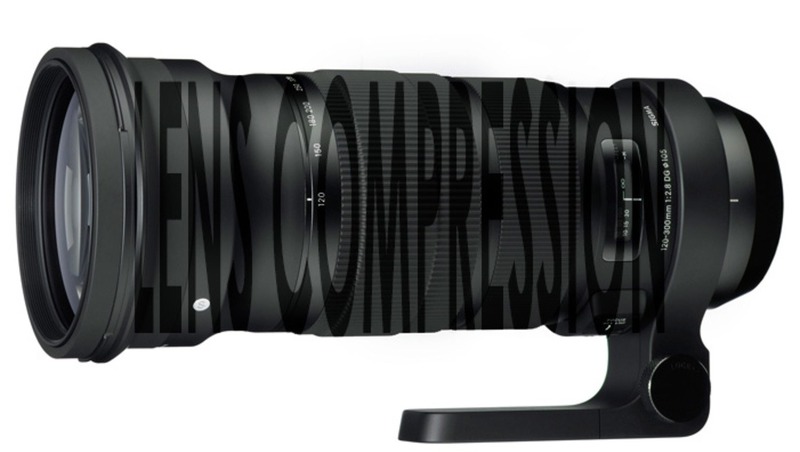 I think he's misunderstanding the fact that although compression does exist LENS compression does not. I responded on his video. Not sure it matters. I agree it doesn't matter I just found it funny lol. Totally true. This is the article everyone needs to read. Its why a FF 35mm can be a great choice for portraiture. Just make sure your distance is the appropriate. Since I'm the mood to "add" to others' comments tonight... I'd say make sure your distance is appropriate BUT ALSO your subject placement is too: you place your subject towards corners and you've got other things in perspective distortion to worry about more with a wider angle focal lengths. I understand what you're saying, but you should really include more discussion of magnification and it's relation to both subject distance & FL. Sure, you can create a compressed image with a wide lens, certainly, but you can't do the reverse. A long focal length constrains a subjects magnification (and the magnification of the background) in a way a wide focal length does not. The lens' focal length still comes into play. If it didn't, you'd be able to go the other direction--create the minimal compression look of a wide with a long one. But, obviously, you can't. I'm not sure I totally understand your point but you can create minimal compression look of a wide lens with a long one by shooting multiple images and stitching like the first example in this article. Fair point. That's not something I can easily do with film. I can certainly crop film. And I can make panoramas with separate frames and hang them side by side. You've chosen to make FL the constant and you've written around that by saying that FL doesn't matter because you can change image format/sensor size (cropping/stitching). You could take this very same article and just flip the script and say "image format" doesn't matter and then just phrase things in terms of focal length and point out for that for a given sensor size, your only option to change compression is by changing FL in relation to subject magnification. You're still talking about the same things, but now you're framing the issue by keeping a different variable constant. "Why should image format/sensor size get priority over FL when either option affects angle of view relative to magnification?" Surely choosing between them is arbitrary! Not at all. When learning photography, we are taught perspective choices, (where you stand, relative to your subject & surrounding objects), and framing, (what focal length lens is chosen, or what is cropped latter in the darkroom). Perspective is decided on strictly by where one stands, and has no bearing whatsoever on focal length nor film/sensor size/aspect ratio. film size, aspect ratio and focal length affect framing, but not perspective. Subject/object compression is all about relative sizes, and is only dependent on where one stands. I'm pretty sure this is the exact scenario that started the whole conversation. You can make a wide angle shot by stitching multiple images shot at a more telephoto focal length. And when you do, you should have the same distortion around the edges if you can get your software to stitch them in an orderly fashion. Not something us film shooters would have thought of! 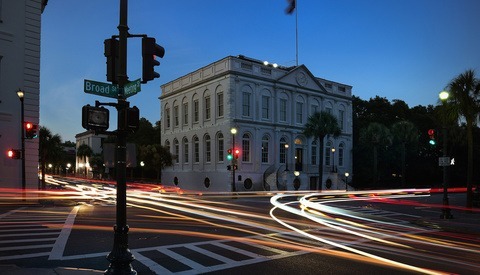 Soooo how do you explain this massive stitching giving a wide angle feel yet clearly taken by many "zoomed in" lenses? What you're noticing in stitched telephoto images (often referred to as the Brenizer method) over a wide angle lens is the difference in depth of field, not compression. I was refering to his comment: "The lens' focal length still comes into play. If it didn't, you'd be able to go the other direction--create the minimal compression look of a wide with a long one. But, obviously, you can't." you clearly can create the "wide" look from a telephoto and a "tight" look from a wide one. Regardless of the semantics, the results are the same. This knowledge isn't going to replace the need for a wide or long lens to get a specific look. That said, the more you understand the physics of photography and how your equipment works, the better. But that is the point of this article, that people are being told to use a different lens and stitch for a different look, when they end up with the same look, had they used the correct lens. Changing lenses and standing in the same spot DOES NOT change the look, no matter how much one stitches or crops. The look is dependent on position only. Lens choice affects framing (until one decides to stitch or crop).